This series of posts is about kitbashing the Walthers kit no. 3104, the “Oil Loading Platform,” to make two platforms, each one single-sided (the Walthers kit structure is intended to be two-sided) and to accommodate a single tank car per platform. The first post (which is available at this link: http://modelingthesp.blogspot.com/2015/03/tank-car-loading-unloading-platforms.html ) was about the general need for platforms like this, and showed the beginning of my separation of the Walthers parts into two structures. The second and third posts continued the description of developing these platforms. 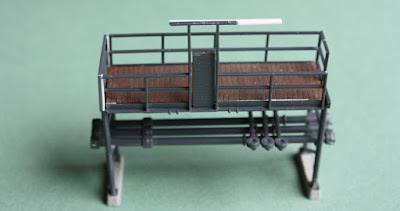 In the second post, I showed my two basic platforms, and described how I used the kit railings for the two separated platforms (see: http://modelingthesp.blogspot.com/2017/02/tank-car-loading-platforms-part-2.html ). In the third post, I completed the platform intended for the winery in my layout town of Ballard, and showed it in place at that industry (that post is at: http://modelingthesp.blogspot.com/2017/02/tank-car-loading-platforms-part-3.html ). 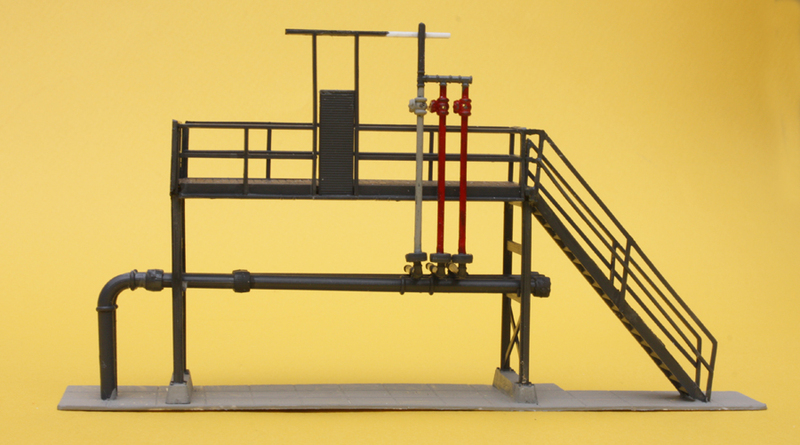 The second platform was intended to serve my chemical repackaging business on the layout. (I have discussed and explained this type of business in a previous post: http://modelingthesp.blogspot.com/2017/02/a-chemical-repackaging-business.html .) Although it is in some ways just like the winery platform, shown completed in the third post, it also is different in significant ways. First, and most significant, this is an unloading platform, while the winery platform already completed is a loading platform. A second difference is that I planned to have the platform piping emerge from the ground, making some piping extending away from the platform itself. 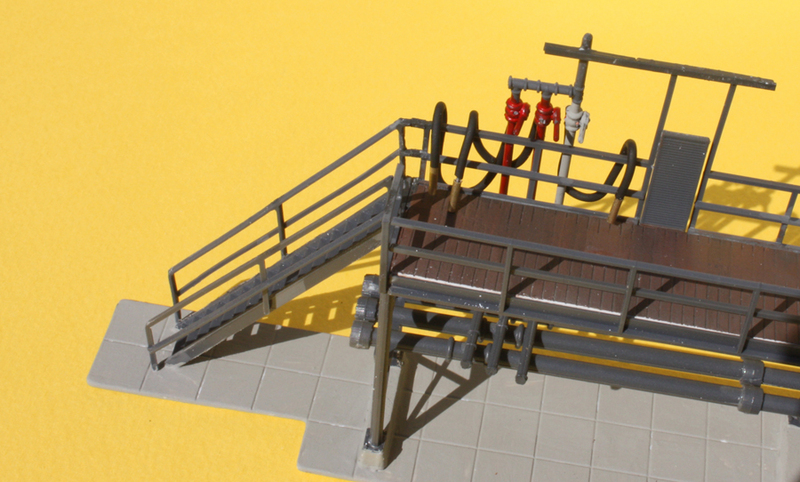 Third, I wanted to use the kit access stairway on this platform, and it extends some ways beyond the end of the platform. I gave some thought to using some kind of base for this platform. But first I had to complete arrangements for piping. As the piping arrangement worked out, the manifold connections were farther to one side of the drop-down walkway opening in the side railing. Since that manifold should be supported at the top of the platform, at the height of the top of the drop-down walk opening, I needed to extend the top bar there. I used a short piece of 0.040-inch square styrene “Microstrip” from Slater’s to match the top bar, then spliced it with a full length of Evergreen scale 2 x 4-inch strip behind it. (The Slater’s strip is close to HO scale 4 x 4.) You can see my extension in white in the photo below. Of course, you might not need to do this if you were careful to align the piping closer to the drop-down walkway. Once I had the extension done, as shown above, I went ahead with choosing a base. I decided to represent the entire structure as placed on a concrete pad. This would tie all its elements together, and also further separate its appearance from the previously completed platform at the winery. For the concrete pad, I chose Evergreen “Sidewalk,” in 3/8-inch squares, their number 4517. Once I glued the platform to this pad, I could quickly add the pipes coming from the ground, and the stairway at the other end. As you can see, all elements of the model are now supported on the single base, making it much sturdier overall. The base has yet to be painted a concrete color. You can also see the small white shims needed to fit the stairway railing to the railings on the platform. In this photo, the base has been painted a concrete color. 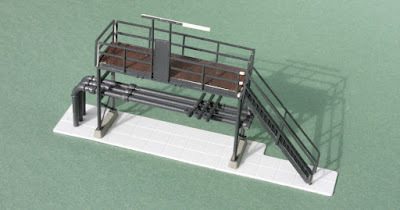 For a high-pressure unloading station, as this is intended to be, it is necessary to model a set of three hoses to connect to the unloading outlets on an ICC 105A tank car. 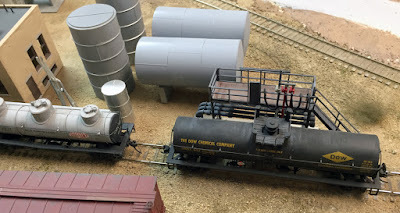 I have described this process in some detail and illustrated how it works in a previous post (you can read the post at: http://modelingthesp.blogspot.com/2017/02/unloading-high-pressure-tank-cars.html ). For hoses I used no. 24 wire, with black insulation. I also used some 1/16-inch brass tubing to represent hose fittings; these slip onto the end of the stripped wire and are secured with a drop of CA. Then each wire was gently formed so that it draped over the railing. The hose attachments are not as obvious in the photo above as I’d like, so here is a view from the other side, looking down into the platform. 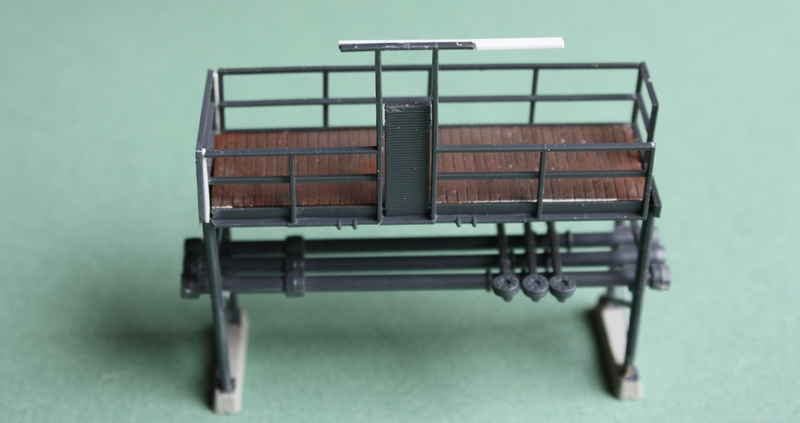 This is, however, not a view that will be available on the layout. With a coat of flat finish to make the appearance consistent, the rack was ready to take its place at the high-pressure car unloading spot at the Pacific Chemical Repackaging plant in my layout town of Ballard. Here we see it in place, though work remains to be done on the plant’s equipment in the background. It has been fun to research, understand and build an unloading facility for high-pressure tank cars, something I had wanted to do for some time. Now I have one in service.